Life Lately, Healthy Crunch, + Other Monthly Finds! Hey Y’all, how are m’Fitties doin’? It’s been awhile since the last Monthly finds, hasn’t it? I missed this. Before I move into that, I want to update you on some things happening in my life. Back from January to March, things were really hectic with a new accelerated course I was taking. Psychology typically a year long course, but I managed to find one that condensed everything into 1 semester. That meant 3 hour lectures 2 times a week…at 8:30am. So that meant no more early morning workouts (I was not about to get up at 6:30 am and do workouts when I slept at 10:30. I had no idea how I managed to keep up that kind of routine in grade 12, when I was working till 11pm at Chipotle). Slowly, I started working out only 3-4 times a week for about 30 minutes, a far cry from the 60-120 minute workouts just about a year ago. What I experienced back in December 2016 (and in China last summer) was extremely humbling, and I refused to put the same expectations on myself to maintain my lifestyle in grade 12. It was a great time of accomplishment, but I had to accept that I couldn’t keep being my fittest self every second of my life. So I tried not to feel guilty for all the time I was skipping my workouts. I didn’t impose a high standard on myself. Gotta multitask, right? 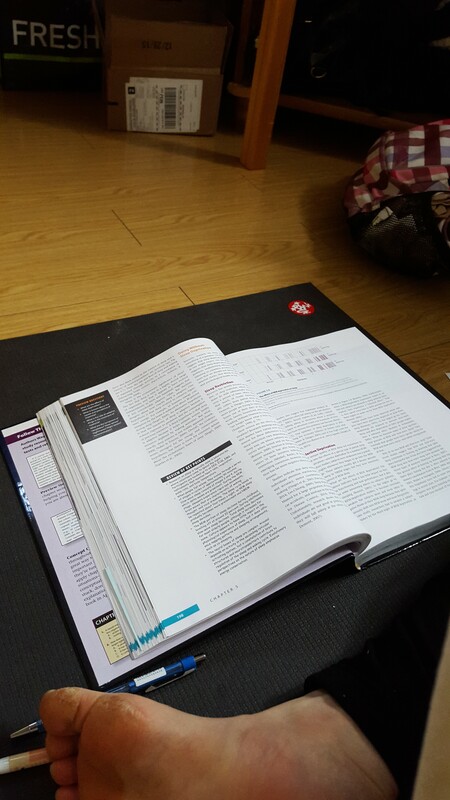 Yoga and studying all at once. Here I am in half pigeon pose, reading my textbook. I went with C, and now, having successfully completed 30 days of this routine, I feel great. I’m glad I was able to prove to myself mentally that I have the discipline and drive to put my mind to something and conquer it. Also, I aced my psychology course and always scored within the top of the class. Last test I scored the 3rd top score. I’m the third mark down! And…I’ve been watching America’s Next top model while stretching. #Productivity?! 🎵This is how I do (uh oh)🎵 This is how we yogis hang out. Watching youtube videos. Do you stretch and watch TV? I discovered this brand through a Farmer’s Market event at my school and was thrilled–you know I’m always on the lookout for sauces and dressings to dress up my food. Sometimes, healthy food can taste a little bland, so things like these, I really enjoy adding to my meals. I like marinating my meats (especially steak) in this. This is extremely yummy. I love how flavourful it is in a single teaspoon. This has a little bit of cilantro, mint, and chilies. It tastes a little bit sour, but not acidic. I love it. I recently went to the Green Living Show and discovered Healthy Crunch. I reached out to them and we agreed to show you guys what they got! They’re organic, and gluten, nut, and dairy free. They’re a great alternative to chips because they use kale instead of potatoes, and all their ingredients are paleo-friendly. This make me realize just how much I missed banana flavor. I don’t eat fruits anymore. This is the dessert kale chips they have that uses blended fruit paste on their chips. I love that it has a hint of coconut and banana to it. I love the coconut-curried crunch. It also has a little touch of mango which I think goes well in the combo; something I’ve never thought of. No, this isn’t made with cheese! It’s made with nutritional yeast, which is every paleo’s (and vegan’s!) secret to making something taste cheesy without using actual dairy. This is their spiciest blend, hence the name, but I think they could afford to add a little bit more punch in their recipe! It takes smokey, sweet and tangy. This one is their most simplest kale chips with the least number of ingredients. They also weigh the lightest so you can eat more in volume and get the same calories compared to some of the chips with more “fruit dressing” which adds weight to them. This one has the least calories and carbs per serving, which I really appreciate. I personally found these to be my favourite! I also love that they have smaller, crumbled up “Kale Crumbs” that I can add to salads and soups. I’m not sure how they do it, but their kale chips taste really well done! I’ve tried making kale chips before, and they never turned out as good as theirs have. I guess they really have perfected their recipe! I kept seeing these adds everywhere–this delivery program here in Ontario and it finally got to me and I jumped on the bandwagon to see what the hype was all about. Chef’s plate offers a meal delivery system where you get to choose the dish, they provide the recipe and deliver all the food in its measured portions. All you have to do is chop and cook! This saves you time from grocery shopping and measuring everything out, especially if you’re too busy to eat healthy and are prone to eating out on the go. I chose the Maple Glazed Pork chops and also the Steak and Balsamic Fennel Salad. They offer antibiotic-free meats, which I love. All their ingredients are nicely packaged in their right portions, but I sure wish that we as customers could pick and choose specific ingredients to match our diets. For example, I couldn’t eat the orange marmalade because it’s not keto-friendly and would have loved to swap it out with another condiment. In the end, I didn’t use their food to make their recipes because there was too much off limits, but I did use them in my own special way in my own recipes. For example, I roasted the Fennel but didn’t use it in a salad, instead I ate it on its own with some sauteed liver. In the end, Chef’s plate does offer fresh ingredients and creative recipes and I’m sure that you’ll enjoy their service. If you don’t follow a specific diet protocol(except for vegans), you can definitely benefit from Chef’s Plate. They offer your first 2 meals for free too! Make you go sign up and take advantage of that. What things this month has been in your routine? This entry was posted in Monthly Finds and tagged chef's plate, healthy crunch, kale chips, Saha cuisine, update.